Kristin Backlund, whose husband is an Air Force ROTC instructor, holds her Alaska absentee ballot. She says obtaining and completing it was a complicated process. Sarah Harris reports on the challenges that military spouses often face when they try to vote absentee. Kristin Backlund just moved to Potsdam, N.Y. from California for her husband's job as an Air Force ROTC instructor. He's still in California, and will move east in a couple weeks. In the meantime, Backlund's gotten organized: she's set up house, started volunteering, and is interviewing for educator jobs. And she's organized about her voting too. Backlund and her husband are both registered to vote in Alaska, another place where they used to live. She's filled out her absentee ballot, but wasn't sure how to find somebody to witness it. Meanwhile, her husband's absentee ballot was accidentally delivered to New York, even though he's still in California. She had to mail it back to him. She thinks little barriers like those can cause military spouses to just not vote. "If I wasn't so determined to vote, it might have been more difficult," Backlund said. "You kind of have to take the initiative and go out of your way to do it." A new survey from the Syracuse Institute for Veterans and Military Families and the Military Officers Association of America found that service member turnout is high in federal, state, and local elections. But spouses vote less frequently. Retired Air Force Col. Mike Turner with the Officers Association says service members usually can get help from voting assistance officers in their unit or from their base voting office. Jim Garrett helps soldiers and spouses with voting at Fort Drum, N.Y.
"That's all for the active duty service member," Turner said. "Spouses are kind of on their own." The study found that while some spouses simply don't want to vote or feel their vote doesn't matter, others are discouraged from casting a ballot because they're not sure how to do it. Frequent moves from state to state and a labyrinth of absentee ballot rules can make voting especially confusing. 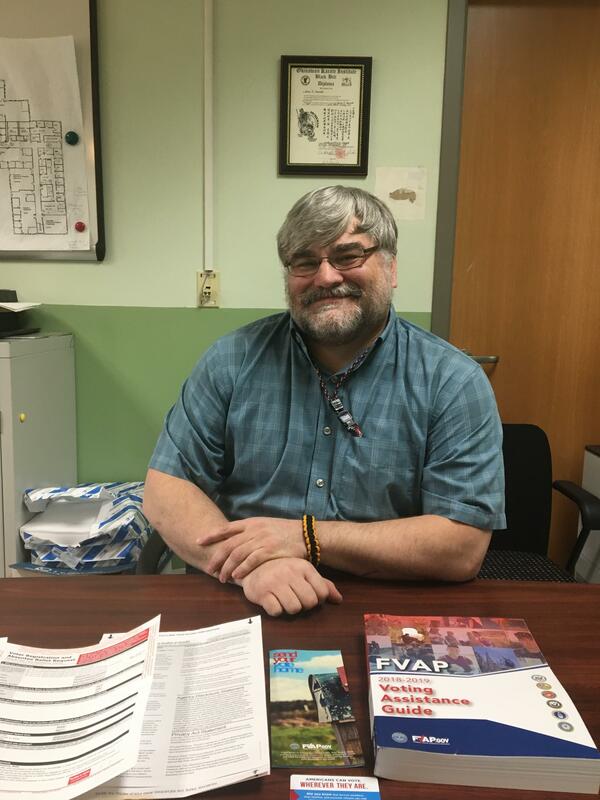 At Fort Drum in upstate New York, soldiers who need help with voting can see Jim Garrett, who runs the base's voting assistance program. Garrett maintains a stash of forms for voting absentee in New York and elsewhere, and has a thick book detailing voting laws for every state. "What it does it gives me the ability to say, 'Well, I want to stay registered to vote in Tennessee,'" Garrett explained. "So I go to the section on Tennessee and tell them what the requirements are, how they get that, and where each of the county voting offices is in Tennessee." Garrett emphasizes that his office helps spouses, too. It can connect them to the same resources and provide the same absentee registration forms. He says spouses can come in directly for help, or soldiers can pick up forms and take them home. "The system is designed to allow us to support the family as well as the soldier themselves," he said. But Rosy Maury from the Syracuse Institute for Veterans and Military Families says the military should be more proactive in reaching out to spouses directly. "You rely on those servicemembers to pass information to their spouses, and obviously there's a gap there," Maury said. "I think at military installations we have to be equally actively engaged in including military spouses in that dialogue." In 2000, the Florida ballots of overseas service members were a key point of controversy in the contested Bush vs. Gore election. Now, 16 years later, little has changed for most overseas troops, who still vote absentee mostly through international mail.